And, along the way, I read another article, “Spatial ‘convergent cross mapping’ to detect causal relationships from short time-series”, by Clark, Ye, Isbell, Deyle, Cowles, Tilman, and Sugihara, which appeared late in December 2014 in the journal Ecology, and the striking paper in PNAS, by Ye, et al, “Equation-free mechanistic ecosystem forecasting using empirical dynamic modeling“. But today I found an article I missed, from earlier in 2015, pertaining to climate change, which has not, as far as I can tell, gotten much play. And it should. That article appeared in March 2015 in Nature Climate Change, and is by Egbert van Nes, Marten Scheer, Victor Brovkin, Timothy Lenton, Hao Ye, Ethan Deyle, and George Sugihara, and is titled “Causal feedbacks in climate change“. One of the favorite lines heard in science denier circles about climate change regards an observation that in the paleoclimate record temperature rises appear to lead increases in CO2 production and, so, they conclude, CO2 increases cannot cause temperature rises. The paleoclimate record demonstrates a very strong association and then geophysicists argue case by case in paleohistory what happened in each event, generally suggesting that the two series, temperature and CO2 concentration, are dynamically interrelated and mutually re-enforcing as a coupled system of differential equations. All that’s true. And, if even in the past, temperature rise occurred first, that does not in any way mean that an abrupt increase in CO2 concentration now would not result in abrupt increases in temperature. 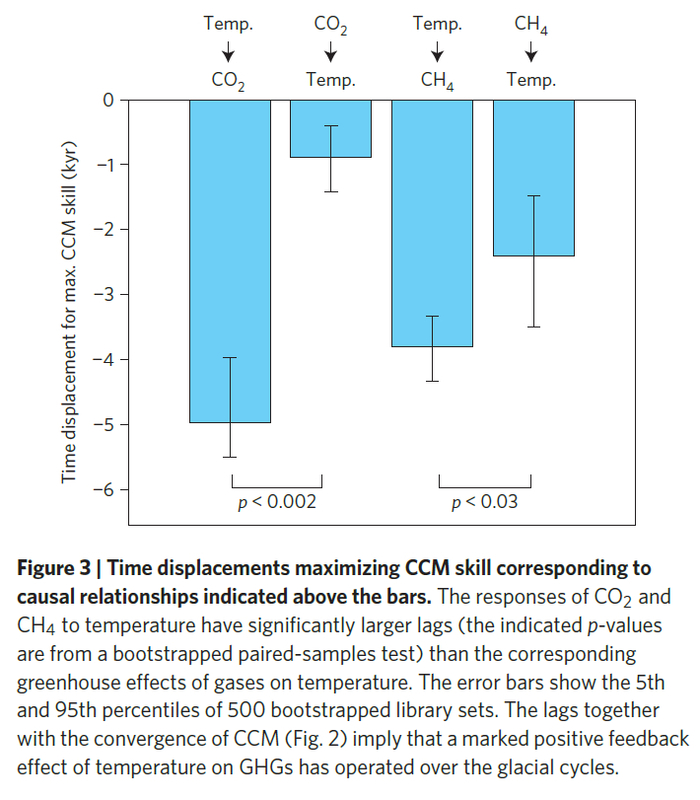 But the remarkable result from van Nes, et al (2015) is that, by applying their CCM method to the two series of temperature and CO2 concentration, they conclusively demonstrate that, yes, indeed, the increase in CO2 concentration is in fact causing the increase in temperature, even there remains an enhancement of CO2 production by increases in temperature. That enhancement proves to be both much weaker than the forcing in the other direction, although it definitely exists. And, to top off the paper, van Nes, et al show “direct confirmation that internal Earth system mechanisms rather than orbital forcing have controlled climate dynamics over the Pleistocene cycles”. The figure below is a reproduction of Figure 3 from their paper. There is more detail in supplementary online information. Another denier claim is now neatly relegated to the trash, without the need for roundabout explanation. Berner, et al do “Stochastic parameterization”. This entry was posted in Anthropocene, boosting, Carbon Cycle, carbon dioxide, Carbon Worshipers, cat1, climate, climate change, climate data, climate disruption, complex systems, convergent cross-mapping, denial, differential equations, diffusion processes, dynamical systems, ecology, Egbert van Nes, empirical likelihood, ensembles, environment, Ethan Deyle, Floris Takens, forecasting, fossil fuels, geophysics, George Sughihara, global warming, greenhouse gases, Hao Ye, machine learning, Maren Scheffer, mathematics, maths, meteorology, physics, rationality, reasonableness, science, state-space models, Takens embedding theorem, time series, Timothy Lenton, Victor Brovkin. Bookmark the permalink.